This is the tombstone of Elvira Reid, nee Headington. The gravestone is located in Green Park Cemetery in Portland, Jay County, Indiana. 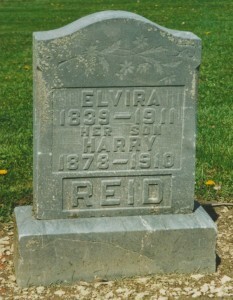 The tombstone reads: REID—Elvira 1839-1911, Her Son Harry 1878-1910. 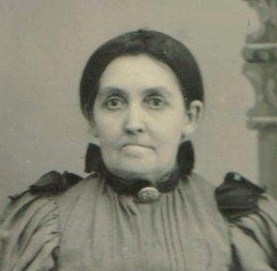 Elvira was my third great grandmother, born 17 April 1838 in Knox County, Ohio. She was the daughter of William and Mary Ann Headington, nee Cotterell, and the mother of William W. Reid. Elvira married Daniel Jacob Reid 27 April 1856 in Jay County, Indiana. (Book B:256) Family history says that Daniel (c1826-1879) died somewhere in Kansas or on the way there while traveling with his family. I do not know exactly when Daniel died or where he is buried. Elvira can be seen in the five generation photo featured in last week’s blog. Elvira’s Obituary: Body Brought Here for Burial–Remains of Mrs. Reid will lie in state at home of her sister Mrs. John Huey–The remains of the late Mrs. Elvira Reid, who died at the home of her son Lowell Reed (sic) at Muncie, early Sunday morning were brought to Portland on the 3:35 train Monday afternoon and taken to the home of her sister Mrs. John Huey, East Walnut Street. Mrs. Reid has been in poor health all winter suffering from liver trouble, which with a complication of jaundice finally caused her death. The deceased was born in Knox County, Ohio, February 17, 1838, and was the daughter of William and Mary Headington. Nearly all of her life was spent in this city. 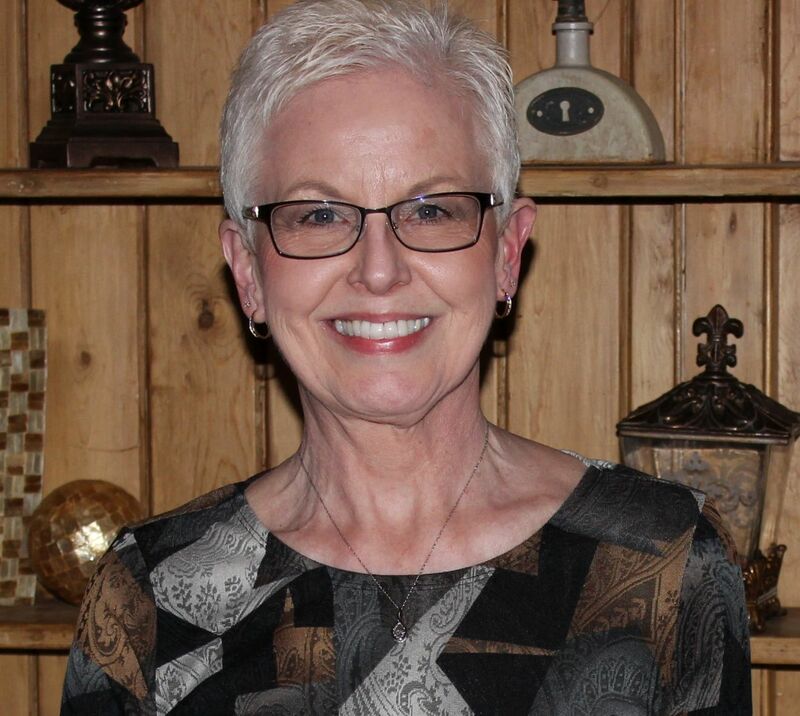 Since three years ago, she has resided in Hartford City and Muncie. Her husband Daniel Reid died 31 years ago on the same day of the death of her father. Six sons survive being Lowell Reid of Muncie, at whose home she died, Charles of South Bend, Andrew of Richmond, James of Kansas City, Missouri, Roland and Albert of Indianapolis. Four children are dead, her son, Harry having died within the last year. Three sisters and one brother also remain, Mrs. John Huey and Wesley Headington of this city, Mrs. L.V. Ogden of Toledo, Ohio, and Mrs. Lu Sanford, of Johannesburg, South Africa. Again, there is a discrepancy in the records. 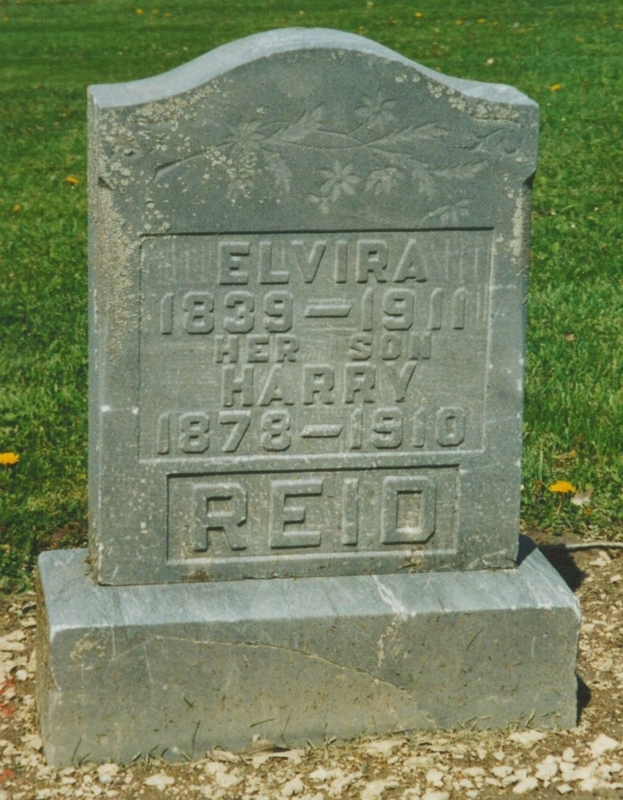 Records created at the time of her death indicate that Elvira was born in 1838, but the year 1839 is carved on her tombstone. Her age varies with the census records, too. This is common with census enumerations since you don’t know who gave the information to the census taker. Elvira and Daniel Reid had 10 children: William W., Andrew Jackson, Charles, James, Minnie M., Albert, Lowell, Frank, Roland, and Harry. Elvira was left to raise most of their children by herself after Daniel’s death. Elivira was my 2nd great grandmother, so hello cousin somewhere along the line!! Do you have a picture of Daniel Reid?? Cindy, There is a photo of Daniel Reid in the “Brewster” Gallery, row 4. He is with Elvira and Andy Reid, in front of a barn with horses. It is a little difficult to see their facial features. I believe that is the only photo I have of him. I am a cousin to Cindy Standfest so I am also related to William and Elvira. If you are on Facebook I might be able to share some pictures with you of the Reids. Sorry, didn’t type my full name on how you can find me on Facebook. I have pictures posted there. Cindy has the full geneology but haven’t been able to get them to share any of it with family here in Indiana. Would be glad to share pictures with you if you are on Facebook.